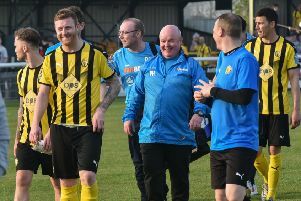 Leamington boss Paul Holleran cut a frustrated figure after his side failed to hang on to all three points against St Neots on Tuesday evening. Brakes looked set to follow-up their FA Trophy victory over Hednesford with a win that would have closed the gap on Southern Premier Division leaders Poole Town to five points. However, Mat Mitchell-King struck with four minutes remaining to earn a 2-2 draw for ten-man Saints and leave Holleran questioning his side’s ability to kill teams off. “Looking back over the season we’ve shown great character to fight back in games but that’s now four or five times that we’ve conceded late goals,” he said. “At 2-1 we had one or two chances that we couldn’t make count. “It was especially disappointing given the momentum we have built up in our last five or so games. “The three points were within our grasp and it was snatched away by a fortunate goal. “Ninety-nine times out 100 we would deal with it. We screened the ball into the box and we were set up well. “But there’s the bounce, a slip from Joe (Magunda)and then a toepoke that has wrongfooted Tony (Breeden). The draw took some of the shine off a fine week for Brakes, which saw them overcome both Rushall and Hednesford to set up an FA Trophy first round clash at Conference Premier side Altrincham. The trip to Moss Lane forms the centrepiece to three successive away games. A visit to Hungerford on Monday December 14 makes up the final game in the tricky trio, but Holleran is not looking any further than the opener, a visit to last season’s runners-up Poole. “They’ve shown great character,” he said. “The league was theirs in March. They were the best team for 35 weeks and had it snatched away in the last four to five weeks. “However, they’ve used it as a positive to kick on and without a shadow of a doubt they are the team to beat. “But we’re confident we can beat anyone in this league and give anyone a game in the league above. “It will be a decent game but it’s when it gets to February that you want to be somewhere near. Ross Oulton will be missing due to suspension tomorrow, while Connor Gudger is still out after a scan revealed a small tear high up in the pubic area.